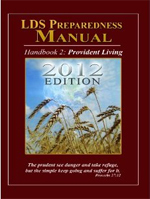 LDSAvow.com has recently released its latest version of their fantastic book “The LDS Preparedness Manual” (now in it’s 8th version!). I figured I’d send this link out as a belated Christmas present for you guys. It’s a fantastic read and highly recommended! If we are ever forced to live through an extended grid-down situation, I think many of us would realize how much we rely/depend upon our “common” appliances like our washing machines. For that reason, having an off-grid secondary option will really make living a whole lot easier if things do go south. 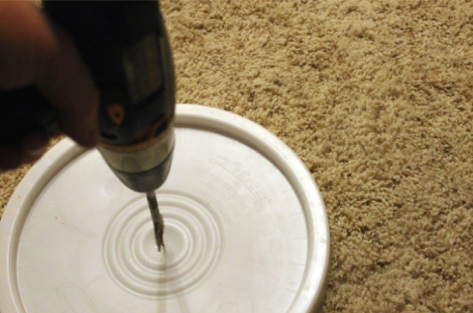 Step 1: Drill a hole in the middle of the lid just big enough for the plunger handle to fit through. 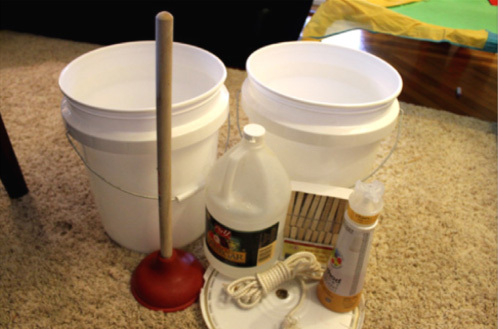 Step 3: Put bucket with items in it into other bucket and place lid (with holes) on top of buckets (feeding the plunger handle through it). Step 4: Store away for a time you need it. Repeat with another load of laundry until water becomes too dirty. 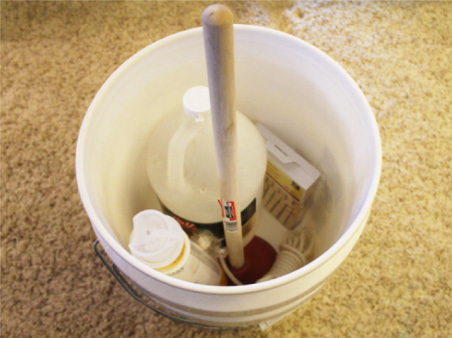 NOTE: You can get away with doing the above steps with only one 5-gallon bucket if you wish. The only difference is in-between washing and rinsing you’ll need to empty the water. If you were ever forced to bug out and survive in the middle of winter, knowing how to stay warm and dry in chilling rain or subfreezing temps is a must. And what if you had to do that without bedding, fire, or a blanket. Would you still be able to stay warm and dry? Since my brother was in town for the Thanksgiving holiday we decided to see how one of my favorite survival shelters — a debris hut — would fare on an overnight in some cold weather. The evening we did the test was going to be in the low 20s (Fahrenheit) so it was a great night to test the shelter out: Will a debris hut keep me warm on subfreezing temps without the need of a fire or sleeping bag? My results are at the end of this post. 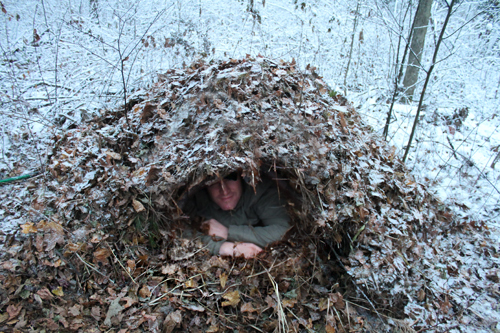 The basic purpose of a debris hut is to provide a cocoon of insulation and warmth — much like a sleeping bag. 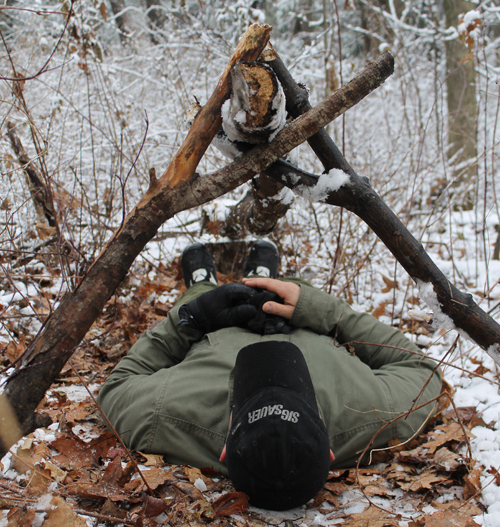 I actually learned this shelter from its inventor, Tom Brown Jr. in one of his survival classes years ago and since that time I’ve had the opportunity to test it on multiple occasions in the Spring, Summer and Fall — comfortably sleeping without the need of a sleeping bag or a fire to stay warm and dry. However, I’ve never tried this out in colder temps below freezing. So this cold-weather test is a long time coming for me. The great advantage of this shelter over, say, a lean-to or other shelter is if built right, it doesn’t require you to have a sleeping bag, blanket, or a fire. It is built to be entirely self-sufficient as an insulator and shelter from the elements. If you live in the Northeast like I do, or another area with lots of debris/woods, this shelter is an excellent one to have in your mental toolkit. 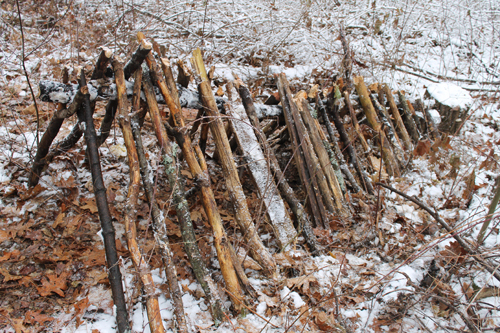 Building a debris hut is actually a fairly simple process. 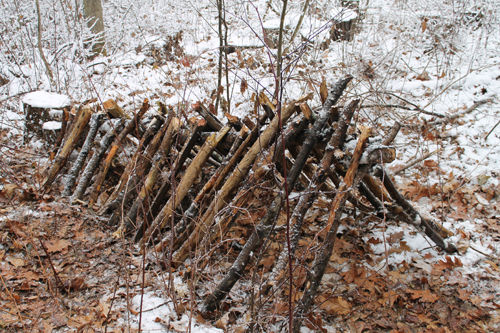 If you live in an area with woods and debris then you’ll have everything you need to build one of these shelters. The key is, you should be able to find all your materials off of the ground. In other words you want dead materials. You don’t want to start cutting down perfectly live trees for this not to mention that being a waste of energy. Step 1: Find an area with lots of debris. As I mentioned before, this shelter is ideal for an area that naturally has a bunch of debris and woods. 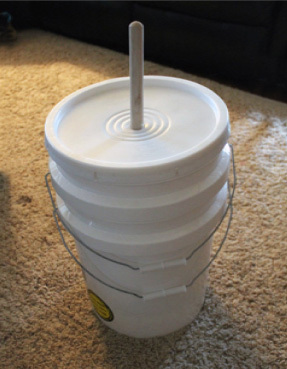 While this can be built in less than ideal locations, it will be well…less than ideal and take longer to build. 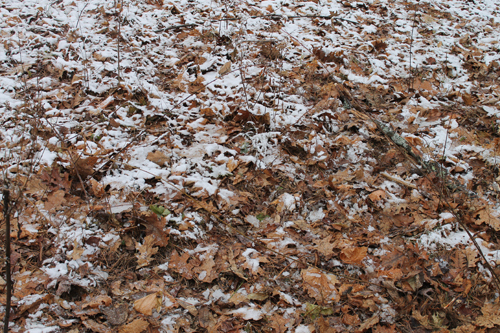 Leaves, long grasses, pine-needles, and so on are all excellent for use with this type of shelter. Step 2: Find a ridge pole almost twice as long as you are high. The straighter the better, however even a crooked one like this will be effective. Step 3: Prop up the ridge pole. 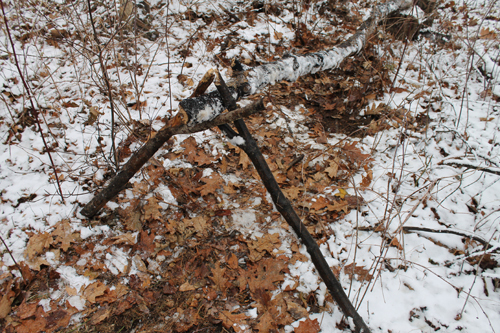 Using two “Y” shaped sticks, the next step is prop up the ridge pole so it sits about crotch height. Be sure you use sturdy sticks (at minimum the size of your wrist) that aren’t brittle or rotting. 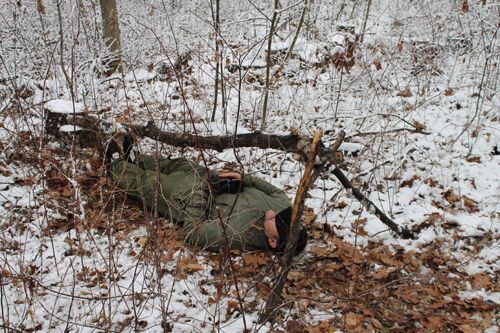 It helps to lie under the ridge pole to make sure that there is a descent amount of head and shoulder room to move a little bit at night. Step 4: Build the framework – Next, using sticks anywhere from two-finger to wrist thickness, create “ribbing” perpendicular along the entire length of the ridge pole. Step 5: Add “stick debris” to the structure – In this step you want to gather a bunch of stick debris and place it all over the structure. 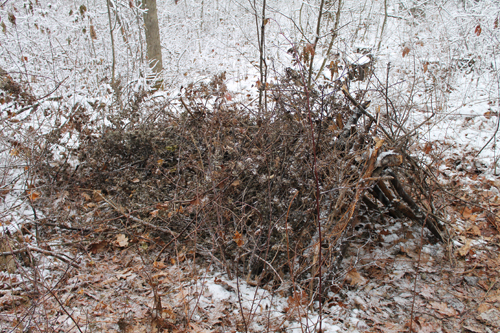 Step 6: Place debris over the shelter – Gather a whole bunch of debris like leaves, pine needles, long grass etc and pile it on top of and in the shelter. 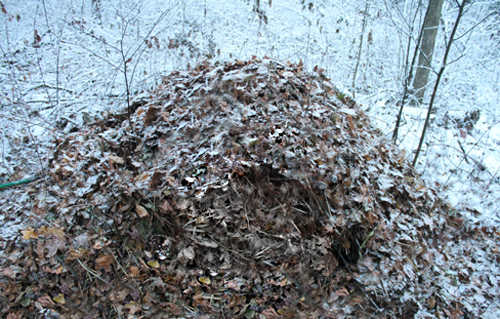 Step 7: Create a thick bedding – After filling the cavity with debris, climb into the shelter and flatten out the debris on the shelter floor. Repeat this at least 3 times to make a thick comfortable, insulative bedding. 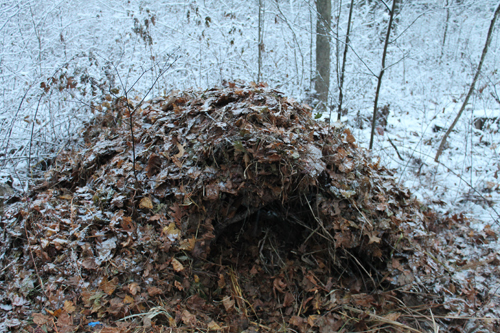 Step 8: Plug up the shelter – When you’re ready to retire for the night, pull in a bunch of leaves with you into the shelter, surrounding yourself with leaves (if it’s really cold) and plugging the entrance — effectively creating a cocoon of leaves. Was I able to get through the night without a sleeping bag in 20 degree weather? I actually made it most of the night without the need for anything extra. I hit the sack around 9PM and slept soundly until around 3am. I must have moved too much during the night because the leaves I had on top of me had eventually fallen off and so there was a gap of air above me that was starting chill me. At that point I grabbed the sleeping bag and slept through the rest of the night. Would I have been able to survive the night without the bag? Yes. However it would’ve been uncomfortable. The issue was I did not have enough leaves on top of the shelter to really contain and hold the heat radiating from my body. There were plenty of leaves below and beside me since my back, bottom and sides were nice and warm. Above me was the issue. 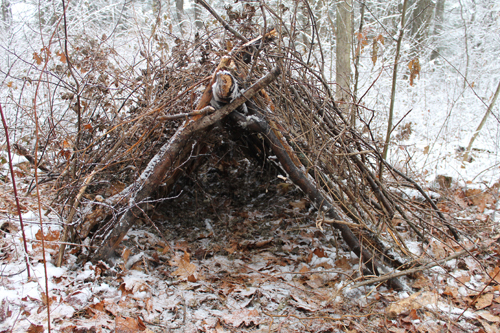 I’m going to try this shelter when we get some colder weather again (right now it’s pretty mild). For the next time though I’ll need to make sure I put twice as much leaves on top. 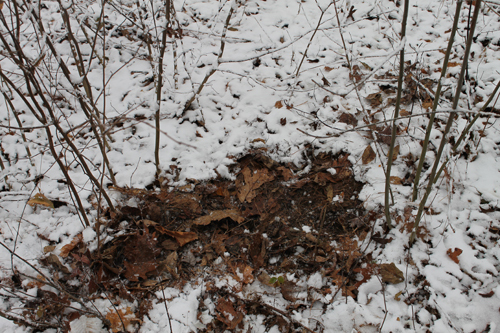 It’s important that the colder it is, the more debris you have over the shelter. 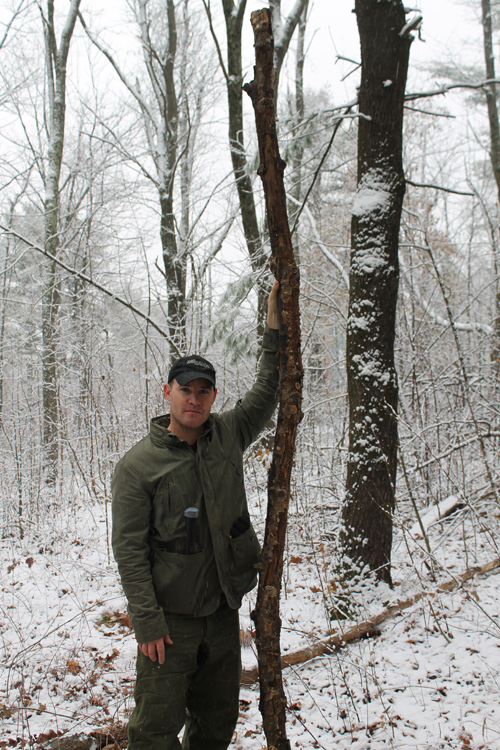 Ideally, from the top of the ridge pole, you want at least one arm’s-length of debris covering it for these colder temps. 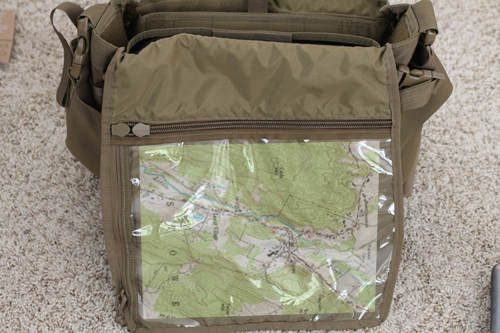 In a previous article I wrote about The Get-Home Bag and why having one with you when you’re out and about is a very important part of being prepared. 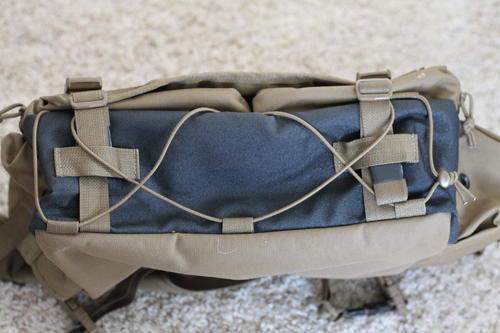 Besides the 5.11 PUSH Pack (the one I recommended as a Get-Home Bag in that article), I now have another bag that I would highly recommend and is the focus of my review for you today. 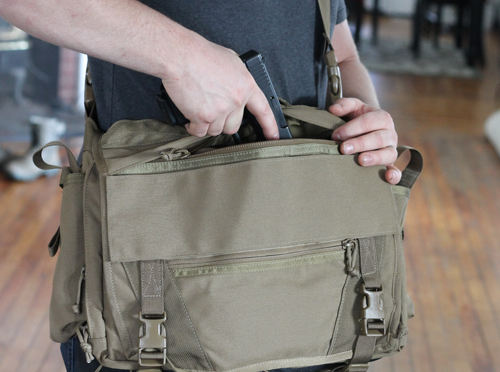 The bag is called the ITS Tactical Discreet Messenger Bag (Gen 2) and it’s designed and sold by the guys over at ITS Tactical.com. I met the owner of ITS (Bryan Black) last year in Vegas at the SHOT Show and he’s a stand-up guy. I’ve been following his blog and work for a while now and they have a great community and some fantastic resources over there so be sure to check them out (Note: I was not paid or given the bag or compensated in any way for this review). My first impression of the bag was the obvious quality. 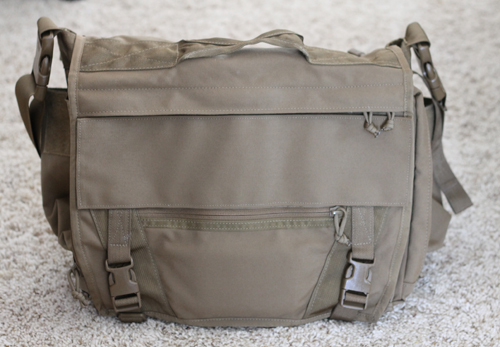 Entirely hand made in the USA from 1000D Cordura, this bag seems like it will take a beating (and then some) and still be around for years to come. In keeping with its name (ie “Discreet”), from outward appearance it really doesn’t display any overly “tactical” features. 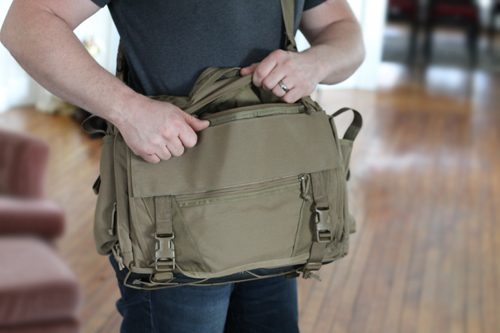 There’s no MOLLE webbing, camouflage, paracord or Velcro and looks like your standard messenger or laptop bag. 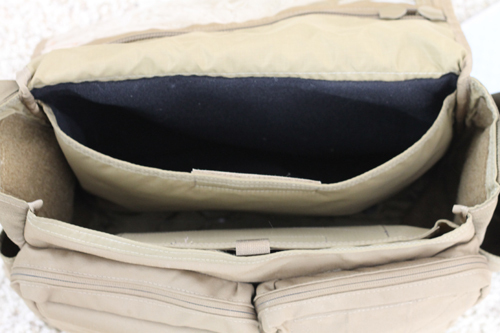 However, when we take a look under the hood, you’ll see that it has a bunch of great features for you tactical junkies out there looking for a great way to carry your gear discreetly. 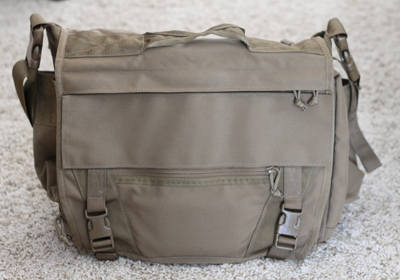 The dimensions of the bag are 15″ long x 5.5″ deep x 12″ tall and it’s available in black, coyote brown and foliage (the coyote brown version is featured in this review). 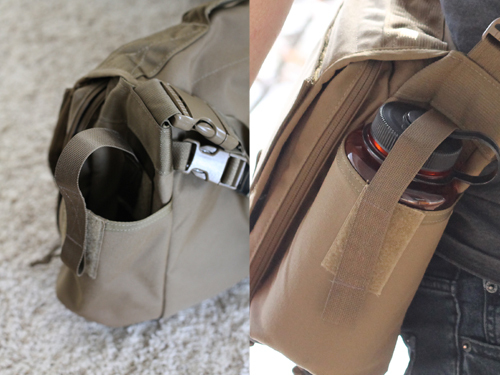 On either side of the bag are bottle holders large enough to fit a standard Nalgene bottle. Also included with each pocket is a removable strap secured by Velcro that will help to retain your bottle if things start to bounce around. On the outside panel you can peel away a cover revealing a 4″ Velcro field for you to attach unit/team/group patches, reflecting patches etc. 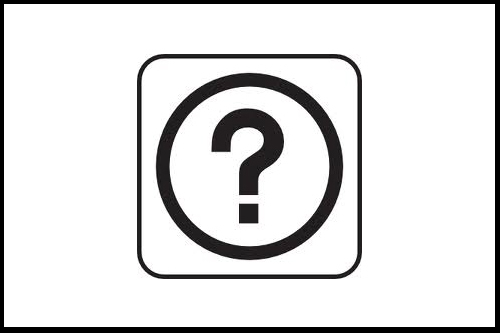 On the bottom of the pack you’ll find a rubbery material (called SlipNOT) that is highly abrasion resistant. Also, there’s a removable weave of elastic shock cord which is great for holding your jacket, gloves or other extra clothing. 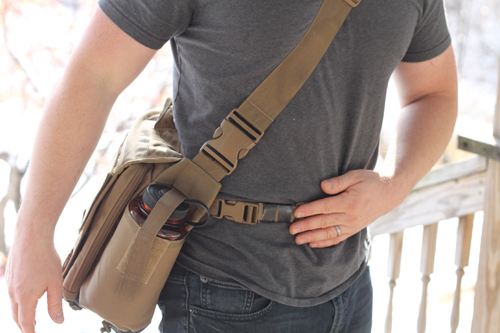 Opening the bag’s flap reveals two paracord drawbridge pockets (7.5″ wide x 9.5″ tall) that contain two elastic-retention magazine pouches and a large rear pocket. These are large enough to fit 4 AK mags or 8 AR/M4 standard mags or Magpul Pmags. 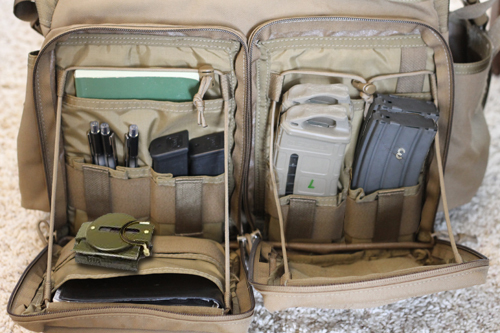 They also can fit multiple handgun mags as well as a host of other gear. On the inside of the outer flap you’ll find a 14″ x 12″ zippered marine-grade vinyl map pocket — perfect for getting home by foot if the occasion ever arose. 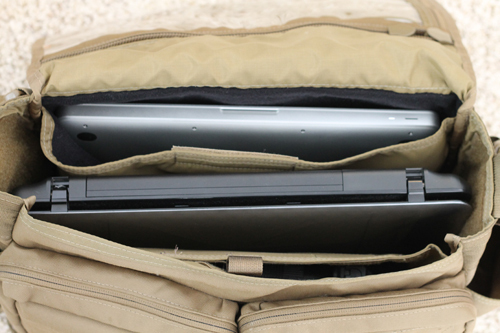 In the main section of the bag you’ll find three inner pockets: a central pocket for your larger gear, a padded laptop pocket that will fit most 15″ laptops, and a deep-looped velcro lined and HDPE-reinforced concealed pocket. 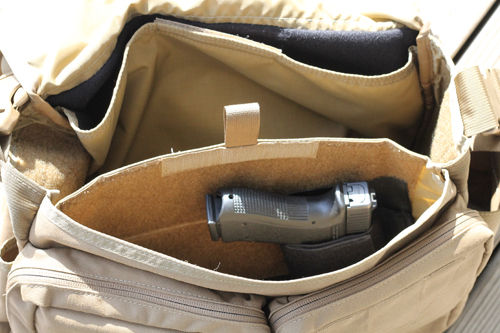 The concealed pocket is perfect for a velcro holster (also available through ITS) and pistol. One feature that I really like with this bag is that the concealed pocket is easily accessible through the top lid via a zippered access. It allows for quick (relative) and discreet drawing of a pistol. Another feature which I really liked with 5.11’s Push Pack which this bag also has is a retaining strap that you can secure around your waist so the bag doesn’t bounce around if you’re on the run — perfect for catching a train or running from zombies. What you’ll also find built into this bag is a secret compartment/pocket. They actually did a great job at making this compartment invisible to even prying eyes. Since it’s to our advantage that people don’t know where this is (sorry guys) you’ll have to purchase the bag to get that info. 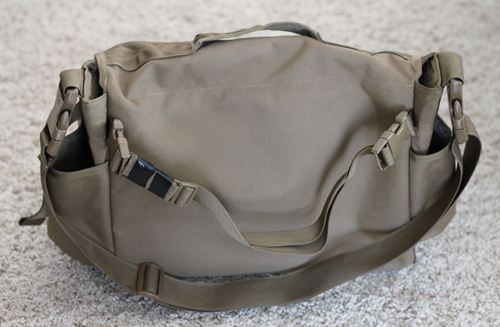 Although the bag has a fairly wide (2″) shoulder strap, if there’s a lot of gear in it with a fair amount of weight it can still get quite uncomfortable after lugging it around for some time. I think having a padded section of the strap would remedy this. On some of the webbing/straps (most notably the waist strap), once you adjust it down to your waist there will be a good amount of it that just hangs and flops around. This can get annoying so it helps to use something to secure it (like electrical tape as seen in the third picture of this article). It would be better to have something like a two-inch wide elastic webbing that is part of the strap that you can tuck this extra slack under/in. 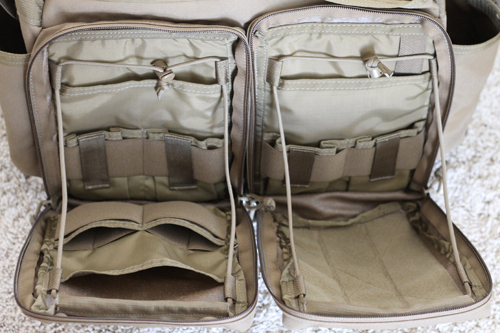 One final thing that I think would be pretty cool is instead of having only that 4″ Velcro field under the cover (see above) is to have some MOLLE webbing hidden under there as well (integrated with the Velcro). 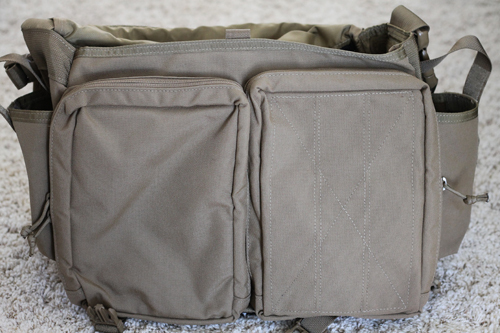 This would allow you to hang some of your MOLLE compatible accessories on the outside of the bag if you so wish. I do get that this would nullify the whole “discreetness” thing, but if you’re taking that panel off anyways for team/unit patches you’re not necessarily looking for discreetness so why not have some MOLLE available as well? I love that the bag is entirely hand made in the USA. Over the past few years I’ve seen a resurgence in excellent workmanship and products coming from small US-based companies like ITS Tactical. Back in my grandfather’s day, being made in the USA carried with it pride and excellent quality. When the big corporations took over and it was all about volume I think we as a country lost something. It’s nice to see these up-and-coming US-based companies bringing quality back. This bag (and other products ITS offers) are no exception. 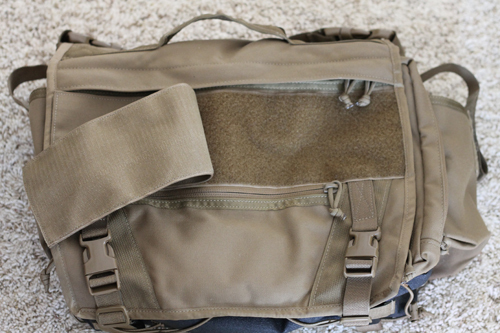 If you’re interested in purchasing a bag for yourself you can find it over at ITS Tactical.